Important Note: This is only for those who use the standard vpasp tax elements; if you have purchased/installed an addon for tax processing then this may not work for that addon. It is also only designed for sites that hold their prices (eg cprice) in their database as tax-excluded amounts. If you store tax-inclusive prices on your site then this addon is not for you. Your raw product prices might not include tax, but you want to be able to show your customers what the tax element is so that they don't get a nasty surprise when they enter the ordering process in the cart. 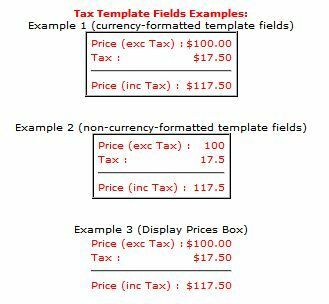 With this addon you can display the tax element, the pre-tax price, or the price-including-tax values in any combination, as each of those elements are separate template-fields in their own right. Included in the addon are detailed examples of how you can use the Tax template fields in your templates. Usually you would use this for "cprice", but you can use any amount column you want by just adding it as the argument in your template-field in your template-file, ie the same logic that the "formatcurrency" template-field. Changed template fields to use arrays as an argument instead of just the cursor (to avoid 8k/memo bugs where values get blanked out in cursors). Made compatible with VPASP V7. Changed html of price box to pass html-validation without errors/warnings.